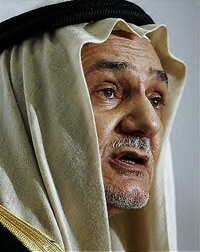 His Royal Highness Prince Turki al-Faisal is a leading Saudi powerbroker. Saudi Prince Turki al-Faisal threatens the U.S. government. Born in 1945 in Mecca to the future King Faisal, his official biography informs us Turki studied at the Ta'if Model Elementary and Intermediate School, the Lawrenceville School, and Georgetown University. His career began in 1973 as an advisor in the Royal Court. He served as director general of the kingdom's main foreign intelligence service for nearly a quarter-century, from 1977 to 2001, leaving that office just before 9/11. Between 2002 and 2007, he represented his government as ambassador to London and Washington. In retirement, he is chairman of the King Faisal Center for Research and Islamic Studies in Riyadh and co-chair of the C100 Group, an affiliate of the World Economic Forum. These credentials help gauge the import of the remarkable op-ed Turki published on Jan. 23 in London's Financial Times, "Saudi Arabia's patience is running out." He begins it by recalling his own efforts over the decades to promote Arab-Israeli peace and especially the Abdullah Plan of 2002. "But after Israel launched its bloody attack on Gaza," he writes, "these pleas for optimism and co-operation now seem a distant memory." Then comes a threat: "Unless the new US administration takes forceful steps to prevent any further suffering and slaughter of Palestinians, the peace process, the US-Saudi relationship and the stability of the region are at risk." He goes on to whack George W. Bush in a way not exactly usual for a former Saudi ambassador: "Not only has the Bush administration left a sickening legacy in the region, but it has also, through an arrogant attitude about the butchery in Gaza, contributed to the slaughter of innocents." Then comes the threat again, restated more directly: "If the US wants to continue playing a leadership role in the Middle East and keep its strategic alliances intact - especially its 'special relationship' with Saudi Arabia - it will have to revise drastically its policies vis-à-vis Israel and Palestine." condemn Israel's atrocities against the Palestinians and support a UN resolution to that effect; condemn the Israeli actions that led to this conflict, from settlement building in the West Bank to the blockade of Gaza and the targeted killings and arbitrary arrests of Palestinians; declare America's intention to work for a Middle East free of weapons of mass destruction, with a security umbrella for countries that sign up and sanctions for those that do not; call for an immediate withdrawal of Israeli forces from Shab'ah Farms in Lebanon; encourage Israeli-Syrian negotiations for peace; and support a UN resolution guaranteeing Iraq's territorial integrity. Mr Obama should strongly promote the Abdullah peace initiative. Finally Turki notes that Iran's Mahmoud Ahmadinejad has called on "Saudi Arabia to lead a jihad against Israel [that] would, if pursued, create unprecedented chaos and bloodshed." He soothingly notes that, "So far, the kingdom has resisted these calls," but then reiterates his threat a third time: "every day this restraint becomes more difficult to maintain. … Eventually, the kingdom will not be able to prevent its citizens from joining the worldwide revolt against Israel." Comments: What to make of this extraordinary threat? Not much. (1) As a Financial Times article on Turki's op-ed notes, "The prince's article recalls the letters that King Abdullah, as crown prince, sent to George W. Bush in 2001, warning that the kingdom would review relations with the US unless the administration adopted a forceful push for Middle East peace. The letters rang alarm bells in Washington but were soon overshadowed by the September 11 attacks, which involved a group of Saudis. It was only after Riyadh launched its own campaign against terrorism two years later and started addressing the root causes of radicalism that ties with the US improved again." In other words, we've experienced such a threat before, to little effect. Prince Turki al-Faisal, Saudi Arabia's ambassador to the United States, flew out of Washington yesterday after informing Secretary of State Condoleezza Rice and his staff that he would be leaving the post after only 15 months on the job, according to U.S. officials and foreign envoys. … Turki, a long-serving former intelligence chief, told his staff yesterday afternoon that he wanted to spend more time with his family, according to Arab diplomats. Colleagues said they were shocked at the decision. The exit [occurred] without the fanfare, parties and tributes that normally accompany a leading envoy's departure, much less a public statement. The Bush administration has left you [with] a disgusting legacy and a reckless position towards the massacres and bloodshed of innocents in Gaza. Enough is enough, today we are all Palestinians and we seek martyrdom for God and for Palestine, following those who died in Gaza. "Seek martyrdom"? Sounds like the revolutionary Iranian regime, not the staid Saudi monarchy. (4) Turki's threats could conceivably sway the Obama administration, but the new president's comments about the recent Gaza hostilities suggest he is going in a decidedly different direction, having laid down three markers that Hamas must fulfill before it can be accepted as a diplomatic partner ("recognize Israel's right to exist; renounce violence; and abide by past agreements"). In the words of a Washington Post analysis, thus far, "Obama appears to have hewed closely to the line held by the Bush administration." Jan. 27, 2009 update: For more by and about this prince, see my weblog entry, "Turki al-Faisal, Leading Saudi Prince, Opines." Related Topics: Saudi Arabia, US policy | Daniel Pipes receive the latest by email: subscribe to the free mef mailing list This text may be reposted or forwarded so long as it is presented as an integral whole with complete and accurate information provided about its author, date, place of publication, and original URL.